ExtraSpel Casino is another online gaming site that has caught our eye with regards to what it has to offer. Given that the safety of personal information and funds is a big deal, it helps to play on a site that you know is under regulatory bodies. This level of accountability means that your rights as a player are honored. While in that area ExtraSpel Casino is winning, they aren’t quite at par with other modern sites. Let’s see where. ExtraSpel Casino runs on a small number of software providers. These are NeoGames, NetEnt, Amaya (Chartwell). Though the software is instant-play, it means that those signing up to the site won’t have a wide selection as they’d expect for a company that’s been around since 2011. The games that ExtraSpel Casino offers are about 230, with the majority being slots. The rest are table games and video poker. They also have live casino games, which is a plus for those who enjoy the thrill of playing with a live dealer. Their VIP sign up program is quite generous as compared to other sites. Deposit methods on ExtraSpel Casino include MasterCard, Neteller, Skrill, Wire Transfer, EcoPayz, Paysafe Card, instaDebit, Visa, and Entropay. There are a total of more than 20 options. As for the withdrawal options, there is MasterCard, Skrill, Neteller, Visa, Bank Wire Transfer, EcoPayz, Skrill 1-Tap, ClickandBuy, Entropay, and instaDebit. With regards to how long withdrawing from your ExtraSpel Casino account to your e-wallet, you can expect to have your money in a few minutes to 24 hours, depending on the provider. Credit and debit cards will have you wanting for three to five days while bank transfers will mean waiting for a five to seven day period to lapse. Pending time for your request to get approved is 24-48 hours. Minimum withdrawal is €10 with the maximum being €10000 per month. 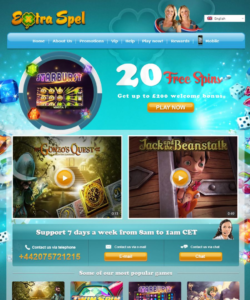 ExtraSpel Casino does offer live chat but available between 8 am to 1 am CET seven days a week. In between this time, one can drop an email to support@Extraspel.com or the online contact form as they await the live chat to resume. The site is in English, Swedish, German, Norwegian and Finnish, meaning you can expect the same with support. The being under global known and reputable gaming authorities make this site trustworthy. That’s why ExtraSpel Casino ranks highly on reviews. If that’s your focus, then you should try out this online casino. However, expect to find a modest game selection. If you don’t mind, then it’s a place to consider playing long term.